Children and young people with Complex Learning Difficulties and Disabilities (CLDD) have co-existing and overlapping conditions which can manifest in complex learning patterns, extreme behaviours and a range of socio-medical needs which are new and unfamiliar to many educators. Their combination of issues and layered needs – mental health, relationship, behavioural, physical, medical, sensory, communication and cognitive – mean they often disengage from learning and challenge even our most experienced teachers. This book provides school practitioners and leaders with an approach and resources to engage this often disenfranchized group of children in learning. The Engagement for Learning Framework has been developed and trialled by over 100 educational settings (both special and mainstream) with learners from early years to post-16. It gives practitioners from a range of disciplines a shared means of assessing, recording and developing personalized learning pathways and demonstrating progression for these children. The focus on inquiry means that however complex a young person’s needs, educators will be able to apply the approach. 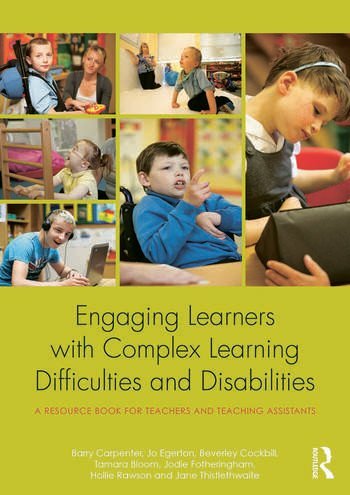 This practical and engaging book provides literature, tools and case study examples outlining who children and young people with CLDD are, why their engagement for learning is important and how the Engagement for Learning Framework can be used effectively by teachers and other professionals to ensure the best possible outcomes for these children. Barry Carpenter, OBE, is Honorary Professor at the Universities of Worcester (UK), Limerick (Ireland), Hamburg (Germany) and Flinders (Australia). Jo Egerton is a Schools Research Consultant and educational writer. Beverley Cockbill is Training Co-ordinator and TEACCH Practitioner in complex learning needs for Chadsgrove Teaching School, Bromsgrove. Tamara Bloom is a Chartered Educational Psychologist working in both local authority and charity sectors. Jodie Fotheringham is a Lead Teacher at Tor View Community Special School in Lancashire. Hollie Rawson is an Occupational Therapist, currently working in mental health rehabilitation. Jane Thistlethwaite is a Complex Needs Consultant, specializing in autism and sensory/vision impairment, and Director of Positive Path International in New Zealand.